Pet Friendly Montreal:Shop the Travel Store! Great and innovative products for you and your pet. Great new finds! 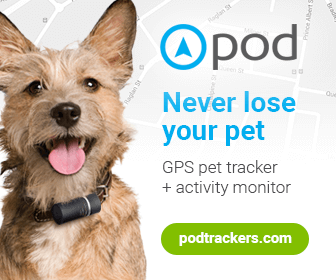 GPS Tracking in a small, lightweight pod. Live indoor and outdoor tracking with unlimited range in 175 countries with 4 layers of tracking technology. -Location history:View 24 hours of location history in the app anytime so you always have data at your fingertips. -Zone alerts:Set up virtual fences and receive breach alerts when your things or loved ones are outside of the zone. -Adventure recording: Record and share adventures with continuous location tracking and motion data. -Attach it to anything: Pod's versatile and easy-to-use strapping mechanism allows you to securely put your Pod on anything you want to track. Pawaboo Dog Safety Vest Harness, Pet Dog Adjustable Car Safety Mesh Harness Travel Strap Vest with Car Seat Belt Lead Clip - Amazon One-Click. $10.99 Buy it here from Amazon - sizes small to xlarge. Keep your dogs safety and under control in the car during driving while still have some range of movement and flexibility. 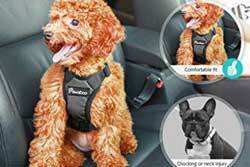 Improves safety by reducing driver distraction and restraining pet in case of sudden stop. Made of oxford fabric, 100% Polyester, it is durable, lightweight and soft. Simple design makes it easy to put on and take off. Broad sponge padded chest plate for extra protection and comfort. It is also suitable for outdoor use to gently walk your dog without choking feeling. Suitable for 11 lb to 33 lb dogs. 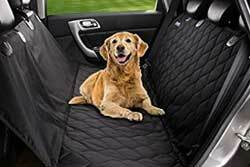 BarksBar Pet Front Seat Cover for Cars - Black, WaterProof & Nonslip Backing - Amazon One-Click. $19.99 Buy it here from Amazon. 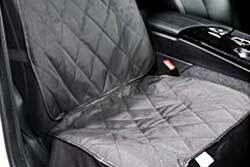 Black & WaterProof: Designed for front passanger seats on all standard vehicles, trucks & SUVs. Made with high quality heavy-duty polyester for durability. Tripled Layered Waterproof PU for Extra Comfortability. Quilted pattern for high-end feel. Also includes built-in rubber nonslip backing and seat anchors to prevent seat cover from sliding around. 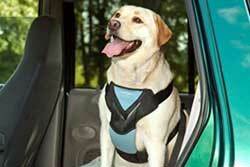 Bergan Dog Auto Harness with Tether - one-click on Amazon: $17.35 Buy it here! Fully-adjustable: Large: for pets 50-80 pounds, Medium; Small; Extra Small. Tethertug has an array of dog toys that are amazing, innovative and fun. Dog Toys for All Sizes & Energy Levels Tethertug has an array of dog toys that are amazing, innovative and fun. This one: "Uber means an excessive degree of something, and Uber sized dogs are dog-ness to the max. They are stately, huge, and utterly captivating, and most are bigger than big! However, there are some dogs that may have a smaller build, but pull like a freight train! The UBER Tether Tug was made just for them!" Designed to remove the whole tick. Great for Home, Travel, Camping. Essential Oils for dogs is a wonderful way to improve their health -- and yours, steamed into the air by this steam dispenser. Sold on Amazon for $23.25, it comes with Lavender oil, which disinfects and purifies the air, and the air your pets breathe (and you...). It smells wonderful. Or try other essential oils... Cedarwood, for dermatitis and flea repelling, or Myrrh, for skin problems and ear infections, sold by www.planttherapy.com . Spoiler alert... I use two of them in my kitchen, one in my office, and one by my bed - Lavender gets rid of my chest colds. Just a few drops in water. The dispenser turns off automatically when out of water. Read more from this Amazon book: "Essential Oils for your Dog". I have personal experience seeing my dogs and cats feeling better by dispensing lavendar oil in my kitchen - it purifies the air all of us breathe and gives their skin a boost. Lavendar is an ancient cleanser - a natural, powerful disinfectant. Give a Bed and Breakfast Gift Card! There is nothing more relaxing than a getaway to a Bed and Breakfast with your loved one - oh you can bring a human too. Called the Getaway Gift Card, from Bed and Breakfast.com , you can send them by email or post. Bed and Breakfast.com is very careful and reliable about their pet friendly bed and breakfasts - much more so than Trip Advisor. 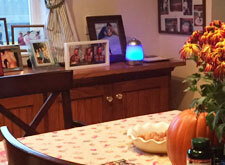 So give a fabulous gift - the gift of a great weekend away at a Bed and Breakfast! Essential Oils for Your Dog: Safe Natural Remedies for your Dog or Puppy -This #1 Best Selling Critically Acclaimed Book is now available Globally on Amazon. 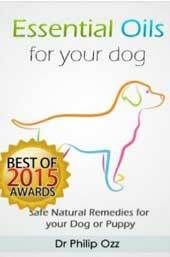 This book is the definitive resource on Essential Oils for your dog. Essential oils give off aromatic smells that harmonize and balance the body while healing it. The principle is simple: the sense of smell takes in the scents which boost inner health which is reflected by heightened physiological functions. This shows how amazing essential oils are in treating a number of health conditions. 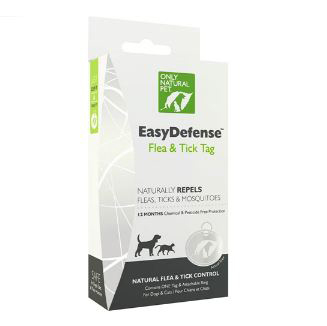 Easy Defense Flea and Tick Tag - natural product. A safe, chemical-free way to keep harmful pests off of your pet. There are no dangerous chemicals or harmful pesticides involved. It is completely safe for pets and humans in the household. The EasyDefense Flea & Tick Tag begins working in just 3 weeks. It remains effective at preventing biting insects for a full year. Protect your pet with the safest, best natural defense against fleas, ticks, and mosquitoes. Bully Sticks - from $2.04! Bully Sticks are a great way to give your pet something to chew on that they'll love and is great for them too. All of our bully sticks for dogs promote healthy teeth and gums. Available in sizes from 6" to 36", our bully sticks are 100% beef, meaning your dog will actually digest them, unlike their old rawhide chews. We hope you'll enjoy these bully sticks made right here in the USA from hormone and antibiotic-free beef. 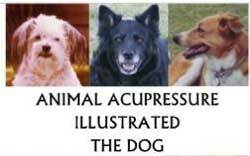 Animal Acupressure Illustrated The Dog, by Deanna Smith. $16.61 One Click Purchase! Designed to make acupressure practical and easy to use for your Dog. With over forty common ailments covered in the easy to follow treatment charts. 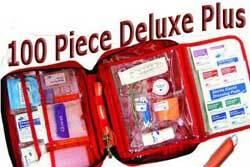 The tools to make new charts for uncommon ailments are included. Written in common language, with instructions on applying pressure and preparing yourself and your pet for treatments. Acupressure care designed to complement your Veterinarians care and give you tools to help keep your pet healthy for a long happy life. 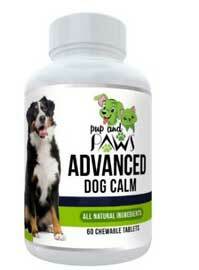 Advanced Dog Calming :: Time Release Chewables :: With Chamomile Flower, Passion Flower, Thiamine Mononitrate and L-Tryptophan by Pup and Paws - $22.99 One Click Purchase! You can see the effects within the first hour of consumption, which lasts up to 24 HOURS. Plus there's no harm if you use another dose after 12 hours (check dosage). Yes, you can have a stress-free party or travel with no harm to your doggie's health. TRAVELLING, MOTION, LOUD NOISES, OR STRANGE SOUNDS ARE NO PROBLEMS ANYMORE! ALL NATURAL INGREDIENTS: Chamomile Flower, Passion Flower, Ginger, Thiamine Mononitrate, L-Tryptophan do name a few, i.e. NO SIDE-EFFECTS OR HEALTH ISSUES!